Early Voting has started at the Downtown Early Voting Center at 217 S. Third Street. Special Voter Parking spots makes stopping by during the day as easy as possible. Open 8am to 4:30pm weekdays for the next several weeks. For details about all the Early Voting options see below. Watch and Share our Get Out The Vote Video! Vote-By-Mail (VBM) allows voters to cast their ballots from any location with the same security protections, but without the hassles and pressures associated with the narrow window of time on Election Day. VBM enables active military service members and their families, voters who are overseas and/or away from home on Election Day, and anyone who otherwise cannot cast a ballot at the polls on Election Day to participate. NOTE: Applications are available in 11 different languages on the EVS website. Early Voting (In-Person absentee balloting) gives voters the option of casting their ballot prior to Election Day and this is primarily operated from the City’s Downtown Early Vote Center located at 217 S. Third Street, one block northwest of City Hall. There, voters can receive their ballot as well as assistance in accessing and marking their ballot from election judges. As in years past, the service hours for in-person voting will be expanded during the final two weeks before Election Day and include weekend hours. More details on in-person voting and the service hours can be found on the Elections website here. Direct balloting allows a voter to cast their ballot at the Early Vote Center in the exact same manner as at the polls on Election Day, with the same securities and protections, just earlier. In direct balloting, the voter completes the ballot and puts it directly into the tabulator and have it processed and counted right then – the exact same experience for voters at the polls on Election Day. Direct ballot is authorized during the final seven days immediately prior to Election Day, which begins Tuesday, October 30 and runs through Monday, November 5. 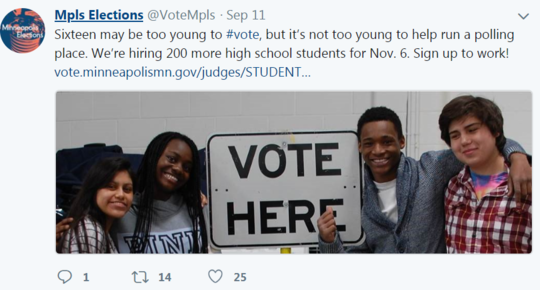 As mentioned previously, Minneapolis will be opening 3 additional Early Vote Centers during the direct balloting period to maximize convenient access to all voters throughout the community. More details on these locations will be shared later through the elections website, social media, and these emails. The EVS website will be updated to provide site-specific details about each of the Early Vote Centers, including details on service hours, transportation and parking options, and similar matters. EVS plans to make a public announcement with these details sometime after the start of Early Voting to help minimize voter confusion. We appreciate your campaigns showing the same diligence in sharing accurate information regarding these sites. ☆Election Day – Polls open 7 a.m. to 8 p.m.